Our much-loved mother, grandmother, and great-grandmother, Barbara Egbert Wynn, 96, passed away peacefully surrounded by family on Monday, April 15, 2019 in Salt Lake City, Utah. 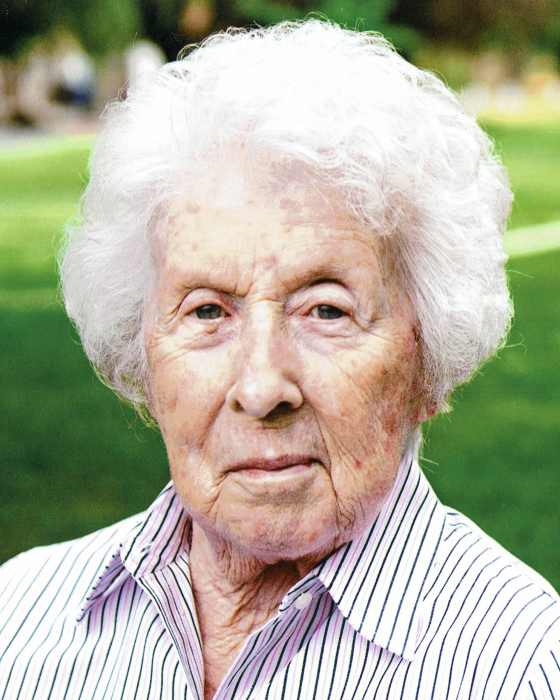 She was born on July 10, 1922 in Layton, Utah to James Irvin Egbert and Eliza Myrtle Peterson and was the great-granddaughter of Utah pioneers Joseph Egbert and Louisa Taylor Egbert. Barbara was raised in Layton, Utah and graduated from Davis High School. She married her high school sweetheart, Edward Sylvester Wynn, on August 19, 1942 in Gardnerville, Nevada shortly before his WWII deployment with the US Army. During his military service, the couple’s first son, Edward Sylvester Jr, was born in 1944 but lived only a few hours. Ed and Barbara were later sealed together in the Salt Lake Temple. They settled in the Avenues neighborhood of Salt Lake City where they raised 5 sons and attended the LDS 27th Ward making lifelong friends. Barbara worked at the Utah Employment Security office for many years. She enjoyed hosting and baking for large Sunday dinners and holidays, and spending time at the family cabin. Barbara was doted on by her devoted husband throughout their 65-year marriage. "Joe" as she called him, loved his wife deeply and never missed an opportunity to open a door for her or hold her hand. She was equally devoted to him, and her catchphrase was “Oh Joe!” In their retirement, Ed and Barbara relocated to Millcreek in the late 1980s and enjoyed golfing, spending winters at their trailer home in St. George, and spending every minute they could with their grandchildren. Barbara will be remembered for her sense of humor, her gentleness, her devotion to family and friends, and of course, her always-full cookie jar. Barbara is preceded in death by her husband Edward Sylvester Wynn (2007), her firstborn son Edward Jr. (1944), her son Steven (2017), and her granddaughter Riquel (2019), as well as her parents and siblings. She is survived by her children James (Sheree) of Sandy, UT, Michael (Linda) of Las Vegas, NV, David of Cottonwood Heights, UT, and Scott (Marilisa) of Lubbock, TX, as well as daughter-in-law Heidi Wynn. Barbara is also survived by 11 grandchildren, 14 great-grandchildren, and 1 great-great-grandchild. Funeral services will be held on Friday, April 19 at 1:30 p.m. at Holbrook Mortuary, 3251 South 2300 East, in Salt Lake City with a viewing prior to the service from 12:00- 1:00 p.m. Interment will be at the Salt Lake City Cemetery. In lieu of flowers, the family requests that donations be made in the name of Barbara E. Wynn to a valued charity.